Aerial photograph of Brunswick, Germany, after being bombed by the US bombers. "9930313-Watch your credit -- International News Photo from O.W.I. | Slug (Brunswick airview) | U.S. bombers blast German aircraft plant | London, Eng. -- This aerial view of Brunswick, Germany, was made after B-24 Liberators of the 8th American Air Force dropped their deadly cargo of bombs on the neupetritor [sic] plant of the Messerschmidt Aircraft Company and nearby airfield, huge clouds of smoke are seen rising from the bomb-shattered ruins of the plant. 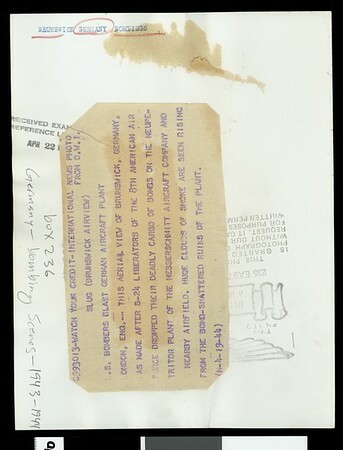 (N-4-19-44)" -- typed note attached to verso. "Received. Examiner reference library. April 22, 1" -- stamped on verso.